My nighttime regimen, from sleeping masks to lavender-scented pillow mists, this one from Earth Therapeutics. I’ve got to hand it to those one-sheet-mask-a-day girls you see all over Instagram. I mean, for me to set aside a good two hours for a masking session (which includes, of course, double cleansing, exfoliating, two rinse-off masks, and finishing with a nourishing sheet mask), it takes some serious planning and aforethought — and I don’t even have kids. After all, I can’t talk, I can’t eat, and the husband, much to his chagrin, has to pause the TV every 15 minutes just so I can go rinse off. What I can’t do with daily sheet masks, however, I make up for with nightly sleep masks. Called sleeping pack in Korea, sleep masks go one step beyond a moisturizer. It “seals” in all the nutrients and actives you just applied to your skin in your nightly routine to prevent evaporation and really allow the actives to get to work as you sleep. Sleep, after all, is when your skin is most receptive to skin care treatments, the time when blood circulation increases, carrying vital nutrients and oxygen to your skin for repair. And a recent Yale study showed that UV damage incurred during the day continues to occur well after the sun goes down, making not only sun avoidance even more important but potent antioxidants and vitamins a crucial part of skin’s nighttime reparative treatment. Now that sleeping masks are gaining some traction in the U.S., there are as many varieties as there are skin types. I like to keep a few on my bedside table and mix and match to accommodate my combination skin and also depending on how my skin is feeling that day. It’s literally the last thing I slather on before my head hits the pillow. 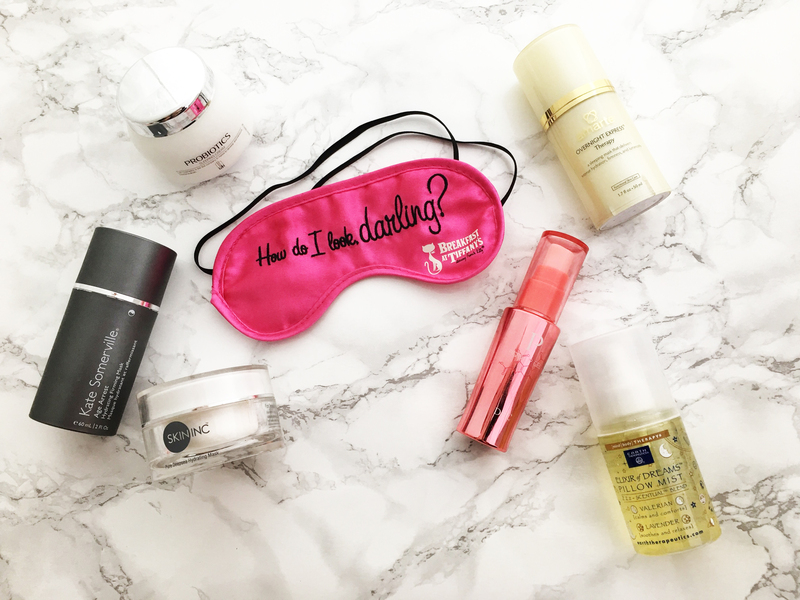 Of course, while I usually apply a sleep mask as the last step in my nightly routine, it’s perfectly fine to substitute a sleep mask for your regular moisturizer (or even serum and moisturizer) on those nights when you just can’t get through your regimen. So which sleep mask is right for you? Read on to find out. If you have dry skin, then you have even more reason to use a sleep mask. At night, our skin temperature drops, and when combined with a dry room (exacerbated by indoor heating or air conditioning), that can leave our skin gasping and parched by sunrise. Goodal Waterest Vital Sleeping Pack is a must for us dehydrated types, with its super-hydrating and soothing ingredients, like the antioxidant-rich fermented lotus, the water-magnet hyaluronic acid, and pumpkin and sage extracts. Its rich, bouncy texture simply melts into skin, leaving it nourished and supple throughout the night. Skin Inc. Pure Deepsea Hydrating Mask also features hyaluronic acid to glom onto all that moisture in the air and in our skin, as well as nutrient-rich Okinawa deepsea water and natto gum, a fermented soy bean, which supercharges the bean’s natural antioxidant powers. It’s so lightweight, it’s like applying a cloud of water that immediately cools upon application, perfect for the warmer months. Yes, even oily or acne-prone skin can benefit from a sleeping mask, especially when that sleeping mask contains 50% probiotic extracts, which early research suggests can help fight acne. In addition to this antimicrobial ingredient, LJH Probiotics Sleeping Cream contains Seamat extract, which reduces surface sebum that can accumulate overnight (you know, when that “glow” becomes more of an oil spill), as well as all sorts of fruit, plant and algae extracts to hydrate and condition the skin (because even oily skin needs hydration). And you’ll love the super lightweight gel feel of this sleeping mask — it almost melts in like water so your skin never feels heavy or sticky. Another genius sleeping mask for oily and acne-prone skin is Amarte Overnight Express Therapy. It has a high concentration of nano-encapsulated retinol, which is released over time, thereby decreasing risk of irritation; anti-microbial, anti-inflammatory propolis extract (one of my favorite skin care ingredients); and witch hazel, all of which help fight and soothe acne. As an added benefit, it’s got silk fibroin, which stimulates collagen and is an anti-inflammatory antioxidant. If your pores look more like sink holes, consider Yuri Pibu Artichoke Night Cream, a nighttime treatment with 60% artichoke extract to firm up the skin, improve elasticity and minimize the appearance of pores. (Glow Recipe co-founder Sarah Lee says she started receiving compliments on her skin after just three days of using the essence version.) And with an ingredient list that reads like a farmer’s market lineup (artichoke, sunflower, lavender, apricot, sweet almond, olive oil, not to mention witch hazel, tea tree, lichen and all manner of botanical extracts), this night cream is a potent hydrator and anti-ager, perfect for those who find themselves in a desperate fight against gravity and time. Kate Somerville Age Arrest Hydrating Firming Mask tackles both sagging and dehydrated skin (which often go hand-in-hand) with new technology based on the Nobel Prize-winning research on the connection between chromosomal telomeres and aging. This rich sleep mask features peptides to fight glycation, encapsulated ceramides to replenish skin lipids, white water lily extracts to help improve elasticity, and algae extracts to soothe sensitive skin. Studies show that the damage to your skin from UV rays continues at night, so until a “nighttime sunscreen” is developed, antioxidants become even more important in your evening ritual. Antioxidants help minimize that damage by neutralizing free radicals. And because different antioxidants fight free radicals differently, layering your antioxidants is your best bet. Yuri Pibu Lotus Water Mask provides that extra layer of protection in its super lightweight, watery gel formula, a lavish blend of antioxidant-rich lotus flower extract (it makes up 77% of the formula!) as well as seven botanical extracts like broccoli, fig and sea kelp. You can use this like a regular mask, rinsing off after 10 minutes, or leave it on overnight for an extra hydrating, rejuvenating treatment. DHC has been coming out with some pretty impressive stuff lately, from their cinch-to-use brow powder to their superhero-inspired Rich Eye Zone Care Pack. Their PQQ Up Gel is no exception. PQQ is a powerhouse antioxidant coenzyme naturally found in the body and one that is gradually depleted due to age and environmental toxins. PQQ targets the mitochonidria, the energy powerhouse of the cell, which works differently from other antioxidants, so layering this with your usual antioxidants (vitamin C, resveratrol, etc.) provides added benefits. It may even help protect against UVA (the aging UV rays). The PQQ Up Gel is super lightweight, almost watery, and offers all sorts of skin care benefits: It promotes natural cell turnover, neutralizes free radicals,and fights the damage caused by glycation, a major aging byproduct of sugar, thanks to Persian silk tree extract. I use the PQQ Up Gel as an overnight mask, but you can also use it as a primer or as the final step in your skin care routine. If your skin has seen better days and needs an extra boost, Goodal Anti-Wrinkle Want Night Sleep Cream Pack might be just what you need. It’s infused with antioxidants like fermented argan oil and sea fennel extract, which studies show helps speed the repair of the skin barrier, as well as macadamia extract, which is loaded with skin-loving fatty acids and also has anti-inflammatory properties. Best of all, its soothing lavender scent will help you get to dreamland faster so your skin repair functions can get to work. As for me, I’ll take each one of the above, thank you very much. Because at any given moment, my skin will feel dry, troubled, aging, damaged or saggy, and often a combination of the above. A sleep mask is like insurance, giving me peace of mind that I’ve done my part to help ward off the day’s damage, and that I’ll wake up to skin that’s chok chok, plumped and glowing. But perhaps best of all, sleep masking makes me feel less guilty about sheet masking only every other week, which in turn minimizes the aggravation of the husband, as I interrupt our binge-watching to rush back and forth from the bathroom during my masking sessions. Because marital bliss? There’s no masking that. Adapted from a story originally published on Glowrecipe.com.